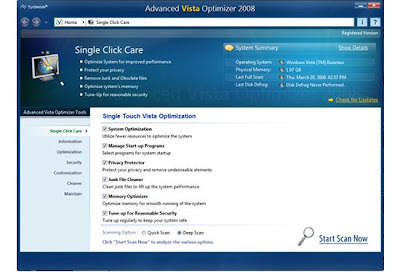 Advanced Vista Optimizer, a comprehensive suite of utilities, works on Windows Vista and XP. Advanced Vista Optimizer helps in Boosting up your PC performance with its powerful optimizing features that are efficient and easy to use. It includes System Cleaners, System Optimization tools, Memory Optimizer, various Tweaking tools, Privacy Protector, Duplicate file finder, various tools for customizing Vista components like Desktop, Internet Explorer, task bar, Start Menu and customizing folders and Windows appearance.